As I left the hotel in West Jerusalem I made a sad observation. I needed to get a bus to Bethlehem. The bus station is near the Damascus Gate. The hotel quoted 30 shekels for a taxi to the Damascus Gate as I had a suitcase etc with me. I told the taxi I needed to go to the bus station that is actually slightly closer to the hotel than the Gate. I was first quoted 90 Shekels and then 70! That is about £12 for a 3 minute drive! It was because I was going to a Palestinian bus station and not a tourist site – obvious prejudice. Another driver said he would take me to Bethlehem to catch the bus there for 200. I wondered how it would help me to get on the bus there rather than at the bus station 3 minutes away by taxi? So I walked then caught the 21 bus that cost 8 Shekels in total! The apartment would be great for a group to use as a base for touring the West Bank. In the apartment I was in there were 12 beds, a large kitchen and meeting room and 2 bathrooms. I am happy to give more information to anyone interested in staying there. In the early afternoon I went to visit Mazin Qusiyeh and his wife at the Palestinian Museum of Natural History, http://www.palestinenature.org/about-us/history/. It is an amazing place and part of Bethlehem University. They have a collection of insects, animals and fauna and even a few live animals that are either sick or donated . Once the Museum is finished it should be a real asset to both Bethlehem and the University. 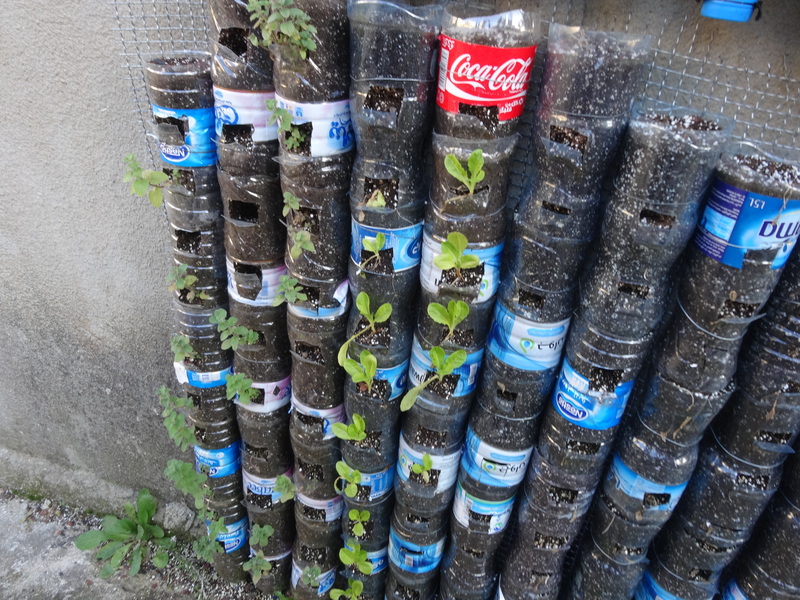 The photo on the left shows a cheap way of growing and irrigating plants using old plastic bottles attached to the side of a house. 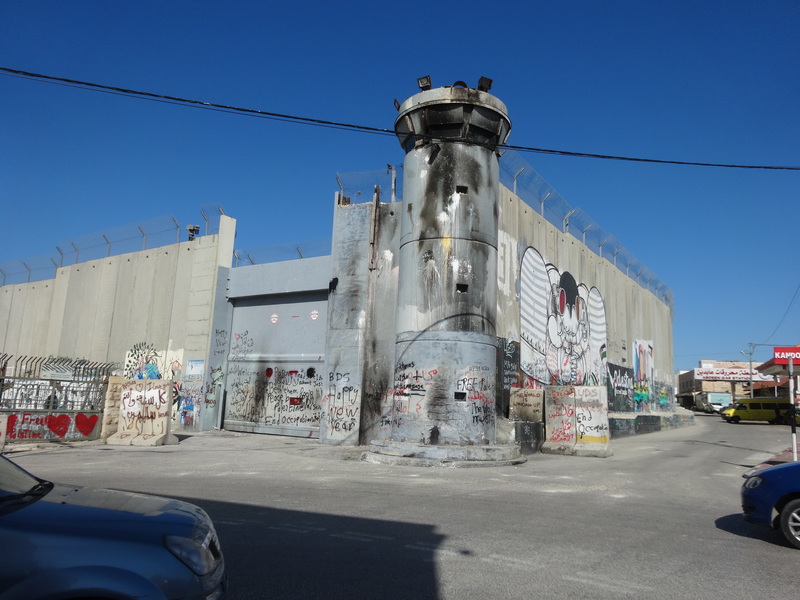 The following day, as many places were closed (it was a Saturday) I decided to walk to the Separation Wall to take photos. One big difference to my previous trips here is the number of men who were desperate to show me around to earn a little money. They were obviously unemployed and desperate. It was not what I wanted and I felt guilty saying no. From a distance I was almost taken in by Star Bucks, especially as there is a Stars and Bucks not that far away, but, no, Starbucks has not suddenly a greed to a Palestinian franchise so it too was fake! I found this Wall story particularly poignant after the stories I have heard from both Israeli and British Jews about the fear they feel both in Israel and around the world. Usama also told me another story, which ties in with what we learned of some of the divide and conquer policies that Israel has towards Palestinian families (see my report on Efrat Israeli Courts). Usama told me that there was an occasion when the Israeli Defence Force, IDF, invaded Bethlehem. He was away from his home at the time and his wife told him to stay away, but his oldest son rang him to ask him to come home as he was afraid. Usama therefore tried to come home, but was blocked by the Israeli military from doing so. The result of this has been a gulf between himself and his son who felt betrayed by his father’s failure to protect him. There has been this effect even without arrests or an actual house raid. The psychological damage caused by the Israeli occupation and suppression of the Palestinian population is beyond measure and rarely spoken of internationally. The next day I was due to leave early for Hebron, but such plans are never straightforward here. In fact the changes to plans are often much better anyway. Marcelle, Usama’s niece, helped me with my cases and while we waited for my transport, she told me about some of the problems she had had being a Palestinian Christian living in Bethlehem. Marcelle told me that she lives in a family of 6. Israel makes a great thing about freedom of worship and is eager to show their generosity to Palestinian Christians regarding permits to visit Jerusalem for Christmas and Easter. Last Christmas the family received just 2 permits for the family, one for her and one for her brother. Her permit was for just one day and the one for her brother entitled him to stay overnight. As she pointed out they were useless to a family of six people who wanted to celebrate Christmas together! Wi’am – The Wi’am Palestinian Conflict Resolution Center began operation in March of 1995. “Wi’am” in Arabic means “cordial relationships,” and developing relationships is the essence of our mission. The Center helps to resolve disputes within the Palestinian community by implementing the traditional Arab form of mediation, known as Sulha, as well as Western models of conflict resolution.